Southeast Asia, seen as a potential winner from the U.S.-China trade war, is starting to see more sour data, with a string of export reports showing that tensions are weighing heavily on the trade-reliant region. Singapore’s exports dropped in December by the most in more than two years, data showed Thursday. Earlier in the week, Indonesia posted the worst export growth in a year and a half. Figures from the Philippines last week showed exports unexpectedly slumping in November, including the first decline for electronics shipments in two years. Weakness in Southeast Asia’s trade reports signals that the economies face more near-term pain, even as analysts point to trade-war benefits for some amid a re-working of tariff-laden supply chains. Chinese export growth slumped earlier this week under the weight of trade penalties as well as a more durable downturn in demand. The waning of the technology boom was felt in the Philippines, where an electronics export decline took its toll in November and overall shipments unexpectedly declined on a year-on-year basis for the worst performance since May. Economic Planning Secretary Ernesto Pernia has said that export growth is unlikely to pick up pace in the near term. 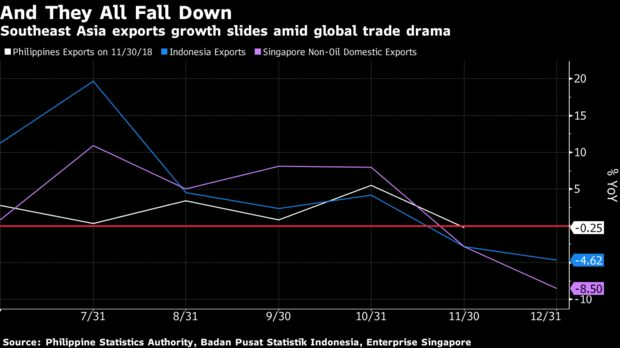 In Indonesia, exports slipped last month in the worst year-on-year rate since mid-2017, defying expectations for a slight rebound from the previous month’s decline. Thailand is due to report December trade data Monday, after the prior month showed just the second year-on-year decline in export growth since February 2017.